Tago Tazvitya was born in Chegutu, Mashonaland in western Zimbabwe in 1954. He is a self-taught artist, and was inspired by the renowned ‘first generation‘ sculptor John Takawira. He has been a full-time artist since 1978. 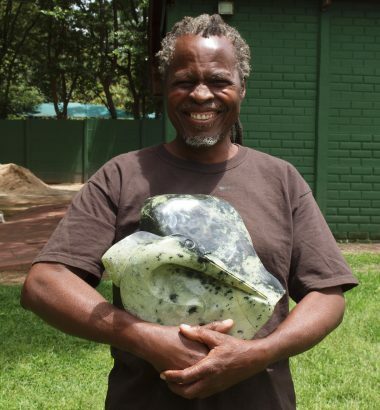 Tago is a senior figure in the local artistic community, and is also closely involved with the National Arts Council (NAC) of Zimbabwe. In 2006 Tago was on the judging panel of the ‘Creativity and Originality’ sculpture competition at CAC. In 2008 and 2009, he was selected by the NAC to be a judge for the prestigious annual National Arts Merit Awards. Tago has spent 3 months each year as a Resident Artist holding sculpture workshops in Germany and The Netherlands since 2009. He has exhibited abroad numerous times, including at the Expo 2000 in Hanover. He also showed in Sydney in 1991 and in London in 1992. In 1995 and 1997 he held solo exhibitions in Berlin, the latter including a workshop with European sculptors.